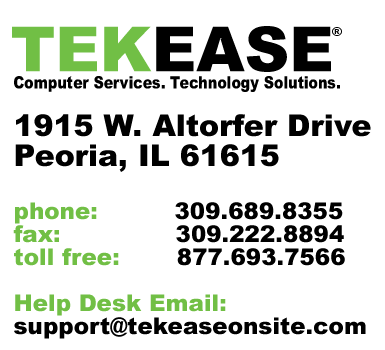 At TEKEASE we like to share what we consider to be the most important ways to keep your PC running smoothly. We call them the 5 Golden Rules. Applying these rules will help to keep your PC much healthier. You should absolutely have a solid system backup solution in place. Over the years our hard drives have become an important component to our lives. They not only contain all of those fabulous tax records and old letters to Aunt Martha, but they contain our memories (photos, videos and music files). If you do not have a verifiable backup solution in place, you could come to regret it in the near future. There are many components to having a good data backup solution. If you are unfamiliar with these, please give us a call to schedule a 30 minute consultation. We have seen grown men and women cry over their data on many occasions. Please, please, please…get a backup solution. A backup solution does not mean a second partition on the same hard drive. At a minimum it should be on external drive or physical media (like DVDs) The backup solution needs to be run routinely. Best practices (even for residential data) include an offsite solution. TEKEASE can offer you many affordable solutions that will protect your data and give you peace of mind. Get 5GB of FREE Secure Online Backup from our partner! While no anti-virus solution can defend you 100% against computer viruses, you should have a reputable anti-virus solution in place. At a minimum you should have one of the freeware solutions installed like those provided in our Self-Support Software area. The paid versions from anti-virus software makers provide all encompassing Internet protection. All encompassing would include a full Internet safety suite with Enhanced Firewall, Enhanced Anti-Spam, Link Scanning, Web-Shield and other vital tools to keep you safe in the connected world. We tell clients everyday that they should not open attachments (like videos, photographs or any other type of attachment) which was not requested or expected. The number one way viruses are spread is through email. You might very well receive an email from your mother with some hilarious video in it…only to find out she didn’t actually send it to you. Many email viruses are self-replicating. The moment your business colleague, friend or family member opens the attachment…the system starts sending a duplicate message out to their address book. The absolute best practice relating to email is to NOT open ANY attachments which you are unaware of. Most importantly, you shouldn’t forward everything you receive to your friends and family. FAMSPAM™ is forwarding every joke you receive to everyone in your family. By not participating in the FAMSPAM™ revolution you are helping yourself and your family and friends out. Please don’t FAMSPAM™. There are very few areas in North America and most civilized areas which don’t have high-speed Internet availability. We often encounter mature clients who don’t think it is available or are simply afraid to get connected because of all the terrible things they have heard are on the Internet. I have yet to meet a single person who installed a high-speed Internet connection and took it out because they didn’t like it. If Internet safety is a concern for you, please give us a call for a FREE Internet benefit and safety consultation.